This Book of Memories memorial website is designed to be a permanent tribute paying tribute to the life and memory of Effie Lazerow. It allows family and friends a place to re-visit, interact with each other, share and enhance this tribute for future generations. We are both pleased and proud to provide the Book of Memories to the families of our community. Effie Lazerow, 97 passed away peacefully in Princeton on April 2, 2019. Effie was born on March 30, 1922 in Lowell, Massachusetts to George and Christina Happas. She is survived by her daughter, Kathryn Mancheno, son-in-law Edward, grandson Nicholas, brother Peter Happas and several nieces and nephews. She was preceded in death by her parents, husband George, son Louis and granddaughter Christina, brother James and sisters Helen, Diana and Mary. Effie grew up in New York City and moved to New Jersey in 1958. She was employed by Johnson & Johnson in New Brunswick and North Brunswick for 24 years before retiring in 1985. She was active in the St. George Greek Orthodox Church in Piscataway, NJ and was a founding member of the Daughters of Penelope organization. 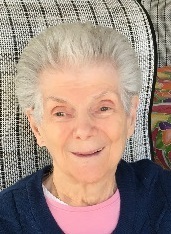 She lived in Bayonet Point, Florida for many years and was very active in the Greek Orthodox Church in New Port Richey. She enjoyed working at their annual festivals and several fund raising initiatives. She was also active in the community where she lived. She had many friends and family there and shared many good times picnicking at the beach and visiting the Greek community in Tarpon Springs. Effie was a very positive person; she would greet everyone she met with a genuine big smile. She enjoyed sewing, reading and cooking. Her greatest joy was her family. She would always say that Nicholas was the “joy of her life”. She moved back to New Jersey in 2010 where she lived with Kathryn and her family.